Do you have a Ninja Turtle costume? Are you near the Mall of America? Are you willing to travel to the Mall of America for a Teenage Mutant Ninja Turtles event? On August 17th there is a Ninja Turtle event for fans that can make it to the Nickelodeon Universe theme park located in Mall of America. This is the place where you can see the Shell Shock Ride, find the rare Splinter LEGO keychain, and shop for exclusive Nickelodeon Universe TMNT Products. This is a wonderful place for Teenage Mutant Ninja Turtle events. And what better event than a TMNT costume contests where fans young and old can share their homemade costumes with other Turtle fans from all around. 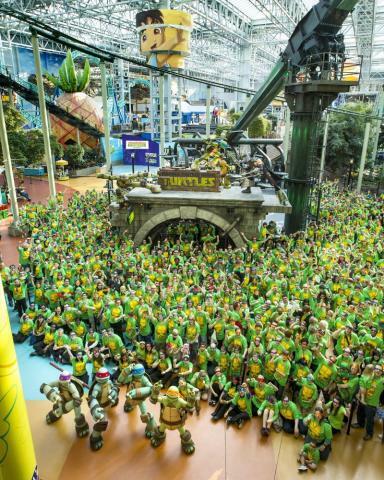 On June 30th 2013, I traveled with my dad to Nickelodeon Universe in Minneapolis, Minnesota to take part in a “Summer of Turtles” event. The Summer of Turtles consists of different events that take place on weekends during the summer. This particular event was the animation event. Michele told me about the event, and that she was going to be there with her sister Miki. I have always wanted to be an animator, and I hope to one day have a career in the animation industry. I knew I had to try everything I could to get there. I initially planned to attend the event on Saturday, but all of the flights that morning had suddenly filled up, and I had no way of getting there. I talked with Michele, and planned on getting there the next day. Sunday Morning, we arrived at the airport. We had three chances to catch a flight and make the event on time. As luck would have it, we made the first flight, and we were on our way from Atlanta to Minneapolis.